REAONS BEHIND is an Italian Symphonic Power/Gothic Metal band, formed in 2010. They started as a cover band, playing songs from WITHIN TEMPTATION, AFTER FOREVER and so on. But it soon became clear that this was a dead end street. The band started working on own material and two years later the first release became a fact. “Ouverture” is a 5-track EP, released in April 2012, with a playtime of a good 25 minutes. In December 2011 bassist Alon, who recorded his parts for this EP, was replaced by Massimiliano Tibaldi. “Ouverture” kicks off with “The End Of Our Chapter”‘s orchestral intro. Bombast is expected and so it happens with midtempo symphonic Power/Gothic Metal. Think NIGHTWISH, XANDRIA and similar. The keyboards dominate in the melodic department (logically) and the verses, where no Metal guitar is present. That’s for the bridge and chorus, but the melodic level remains high. Elisa sings with an operatic voice and will try for the higher regions, at which point her voice sounds faint, as the operatic touch is not used then. Halfway the song it’s the orchestral input’s moment of fame with twinkling sounds, strings, etc… The overall feel and atmosphere is one of humility, modesty. The singing is nicely inline with that. All in preparation for the bombastic piece that is next: orchestral melodies rule, the guitars and drums take care of power. I like it! After that it’s back to the chorus and on its way to the ending. Next is “My Last Act”. A intro filled with mystery and orchestrations, building tension before the egg cracks open bit by bit. Once open, we’re off with a good drive and double bass, all sounding like (old) NIGHTWISH. Yep, here as well, operatic vocals, but an uptempo chorus, which is very nice. About those vocals, I have to admit that Elisa’s timbre isn’t always pleasant, so to speak. Nothing against operatic singing, but as the voice is an instrument as well, it can always happen that this specific sound doesn’t perfectly match the other sounds. I do like how REASONS BEHIND arranges it songs, as at some point the Metal stops and you get a piano moment (with vocals), after which full power (with leading symphonics) is activated again, into an instrumental bridge connecting with a more solemn, clean (= not distorted) piece. The Metal does returns, but only to carry the song to its end. Electronic keyboards and Metal collaborate in “1000 Fading Lives”, which – depending on how you hear it – sounds a bit like a mix of AFTER FOREVER and LUCA TURILLI’S DREAMQUEST. Atmospheric Power Metal is delivered in the verses, while full speed is chosen for the melodic chorus. And this is a nice shift, indeed. Symphonic elements lead to a dreamy bridge, after which drums announce the coming of a bombastic intervention. The music shifts between Metal and an atmospheric, calmer piece to link back to the chorus. Solos are provided by guitar and keyboards, taking turns. The vocals, in general, are good, but the operatic high notes aren’t always suiting. I noticed Elisa sang with a cleaner, softer voice earlier on (not in this song), so why not apply that kind of voice here too? Other than that, all seems fine to me. “Choices” has church bells and a cinematic intro (with brass and strings) to begin with. Midtempo, melodic Metal kicks in after that with a nice flow. Powerful verses contrast with a cleaner bridge, while the chorus sounds more wavey (by lack of a better word). Before the obligatory guitar solo – and since melody is key in the compositions – you get a nice piano break, followed by a keyboard solo. The piano also is the last you’ll hear. Good song, all things considered. Last but not least there’s “The Last Night Of Ilion”. Ilion was the ancient Greek name for Troy. And this song is a ballad. It begins with the piano and symphonic backing. It does have Metal touches, but the whole clearly remains a ballad. However, the melody reminds me of another song, but I can’t put my finger on it. Darn! After the symphonic break later on, the music does become more Metal, plus adds the guitar solo. 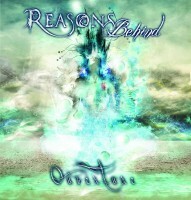 REASONS BEHIND is a new band to the pool of symphonic Metal. There are of course plenty such bands and although these Italians add nothing new, they do know how to keep their songs attractive with nice melodies and arrangements. The production could have been a bit better, but nowadays, without a sufficient budget, it’s not easy. But right now, that element is trivial, as this is a first release and contains pretty good songs. The stuff flows well, there’s a nice balance between Metal and melody. My only point of critique would be the vocals: operatic is good, but not always appropriate, not when a clean, regular timbre would probably be more beneficial. But that’s up to the band. Other than that, REASONS BEHIND can be proud of this first release.